Was Ukraine under Soviet occupation? The Soviet Union had a unique opportunity to mobilize its human and economic resources to reach a single established goal. On the one hand, this was explained by the fact that Soviet power was deeply rooted in the masses (not coincidentally, communist ideologues defined it as a “workers and peasants’ power”), and on the other, by the absolute inability of the masses, the millions of members of the ruling party, and even the nomenklatura to influence the decisions made in the very heart of Soviet power — the Politburo (Presidium) of the Central Committee. The whole country resembled a lightweight athlete (and lightweight it was, considering the degree of its economic progress) competing in the heavyweight division. Miraculously, it succeeded in overtaking the United States in terms of missiles and space exploration for a long period of time. However, focusing maximum efforts and means on a single objective always has a grave effect on the living standard, yet after several decades of terror there were practically no protesters left. The fact that Ukraine was at the epicenter of terror tempts some people to regard Soviet power there as occupational in nature, all the more so as this power was enforced by three consecutive interventions by Soviet armed forces. After the empire fell apart, Ukraine had built a national independent state that was rooted in the same democratic values as the Russian republic under the Provisional Government. But things were not so simple. The Communist Party/Soviets tandem gave the Bolsheviks an invaluable advantage over the White Guard generals, who stubbornly persisted in restoring a single and indivisible Russia. In fact, the Bolsheviks shared the generals’ desire, and they had a way of avoiding confrontation with the national liberation movement of oppressed peoples, and even of using their human and economic potential for their own purposes during the Civil War. Russia’s central government demanded only one thing from these peoples: the Soviets as the basis of their political system. From the heights of our contemporary knowledge we should clearly understand the deep subtext of these high- flown words. One year earlier, in January 1917, Lenin and his fellow thinkers were still a numerically weak faction in exile. Within a year they had become a mass party whose goal was to restore the colossal empire and even to spark a worldwide conflagration. The war was still going on, and everyone felt that it had to change the world order. During three and a half years of war in the trenches soldiers on both sides lost the sense of the value of human life. Workers and peasants kept up their backbreaking toil, yet what results they produced were instantly consumed in the inferno of war. The planet was becoming gripped by blind class hatred, and all the Bolshevik agitators had to do was aim that destructive force in the right direction. Lenin called his party a drop in the people’s ocean, and he believed that he had found in the soviets an all-purpose lever of power with which to build a “state-commune” amidst the debris of the warring empires. The Bolsheviks knew how to deal with the soviets that, in the eyes of other political parties, were like wild mustangs. The British science fiction writer, H. G. Wells, was wrong when he described the Bolshevik leader as a Kremlin dreamer. The utopian tale about communism as a system under which each individual would receive as many benefits as he desired was meant for the masses. For Lenin and his associates, the Soviet system was merely a convenient form of political and economic dictatorship. The colossal capacities of the dual structure of Soviet power in constructing outwardly independent nation-states (all of which were actually fully under the Kremlin’s control) were no secret to Prof. Richard Pipes, a noted US expert on Russian history. In his book Russia under the Bolshevik Regime he writes that, once the territories inhabited by non-Russians were reconquered and drawn into the new Soviet empire, they obtained the fiction of statehood under the condition that their institutions also began to be controlled (“paralyzed,” in Lenin’s words) by the RCP(B). Lenin never intended to fragment his party on a national basis. The result was federalism with all the hallmarks of statehood that were ostensibly capable of satisfying the principal demands of the non- Russian population, but which concealed a rigid centralized dictatorship based in Moscow. This long but necessary paraphrase illustrates the concept of national Soviet statehood, which is widespread in the West. Everything is correct there, but there is a lack of details. These details, overlooked by Pipes, conceal the essence of the Bolshevik approach to the nationality question. Pipes’s statement that state power in the country of the Bolsheviks only formally belonged to the soviets may be regarded as a formal one. Pipes failed to notice that the soviets that existed in 1917 had disappeared. There is no doubt that the soviets in each link of the power vertical were completely subordinated to party committees. There is also no doubt that the wild mustang of the Russian Revolution had turned into an obedient gelding after the October coup. The mechanism of this transformation proved to be very simple, verging on primitive; the soviets became part of the Bolshevik Party and therefore enjoyed full executive authority. One cannot, for example, underestimate the role of the Council of People’s Commissars (Sovnarkom), headed by Vladimir Lenin, which was at the top of the Soviet power vertical. All this indicates that the soviets were also a completely realistic power in the national republics, not a “fiction of statehood.” They were “paralyzed” along the party line if the Kremlin thought it necessary. However, the members of the centralized and disciplined Bolshevik Party in Moscow, who were placed in charge of the national republics, did not have an easy time of it. They constantly had to keep watch in order not to lose control of the situation in the republics and even to make sure that the branches of the RCP(B)-AUCP(B)-CPSU remained absolutely loyal to Moscow. The leaders declared that the nationality question was of secondary importance and that it was subordinated to the class one. In reality, they were paying close attention to the national periphery in their own state. They were especially diligent in keeping track of the processes unfolding in Ukraine, the largest Soviet republic in terms of human and material resources, which bordered on Europe. The Soviet empire, created by Lenin’s party, no longer exists, and we now have the opportunity to study the circumstances behind its birth and death at the same time. We can establish the collision that emerged when the Soviet power was being actively promulgated in the national regions. The nature of this collision was that a totalitarian state with a minimum number of carriers of dictatorship was simultaneously an aggregate of countries (known as Union Republics from 1923) where the existence of national governments on which real administrative authority had been conferred was permitted. These national governments were totally subordinated to the central government, but their very existence created the appearance of a democratic state for the Soviet federation, in which ruling powers were divided between the center and its subjects. But this was a pseudo-federation. In all the Soviet Constitutions the term “federation” was used only in the names of the republics. A federation is impossible without a division of power and a dictatorship rules out such a division. The communist system was created contrary to the interests and desires of the majority of the population, especially the peasantry, which comprised the majority of Soviet citizens. Therefore, mass terror was inevitable everywhere. However, in concluding the survey of this topic, I think it would be to the point to raise the following question: Did the intensity of this terror vary between the Russian and non-Russian regions? The answer stems from the preceding survey: the multinational country made up of republics vested with national statehood and considerable constitutional rights was always threatened by collapse in the event of a crisis in the Kremlin. Such a crisis would make the dictatorship impossible. Paradoxically, the more constitutional rights the national republics had, the greater the threat of repressions they faced from the Kremlin. Why did the leaders of the RCP(B) place Soviet national statehood into the building of their “state-commune,” if they realized that this state could turn out to be a source of separatism? Wouldn’t it have been simpler to form national republics without any hallmarks of statehood? There was all the more reason for this, as from its very inception the Russian Federation was being formed as a centralized state with an autonomous, i.e., stateless, order in its national regions. The answer to this question is quite simple. Lenin and the other leaders of the RCP(B) saw the dangers of national Soviet statehood, but they were forced to accept a compromise with the liberation movement, which after the collapse of autocracy had split asunder the former empire into its various component parts. The building of Soviet Ukraine in the Kremlin is a good illustration of all the tortuous turns of the Bolsheviks’ nationality policy. Today, more than ever, we are turning to the events of the Ukrainian Revolution because its 90th anniversary will soon be upon us. A discussion of the occupational nature of Soviet rule cannot proceed without comparisons between these events and the events of the Russian Revolution. Nor should we forget that the Russian Revolution also took place on the territory of Ukraine. At issue is the activity of all-Russian parties, trade unions, and soviets; the formation by the Bolsheviks of Red Guard armed detachments; and the Civil War between the Whites and the Reds. In their turn, the events of the Ukrainian Revolution also spilled out beyond the limits of the territory where Ukrainians formed the majority of the population (consider, for example, the Ukrainization of the army on all Russian fronts). The Bolsheviks got the idea to create Soviet Ukraine during their struggle against the Central Rada. Lenin believed that it was possible to gain control over the Ukrainian National Republic (UNR) by convening an all-Ukrainian congress of soviets, according to the Russian scenario, and electing a substitute for the Central Rada, namely the Central Executive Committee of Soviets of Ukraine. In making arrangements for that all- Ukrainian congress, the Sovnarkom deviated from the previous Russian government’s fundamental principle with regard to the borders of Ukraine. The Provisional Government had agreed to recognize Ukraine as a political reality consisting of Kyiv, Volyn, Podillia, Poltava regions, and part of the Chernihiv region. At issue was Hetman Bohdan Khmelnytsky’s state, which had been annexed to Russia in the mid-17th century. In other words, Ukraine’s possession of Sloboda Ukraine and the Azov-Black Sea steppes, colonized mostly by Ukrainians, was not recognized. But the chain of soviets under Bolshevik control was more or less developed precisely in the eastern and southern regions of Ukraine. Here one could expect success for the scheme to replace the Central Rada by the Central Executive Committee of Soviets of Ukraine only in the event that Ukrainian national statehood was recognized on the territory of its nine gubernias. In this text the identification of Bolsheviks according to their place of residence was unquestioned, albeit intentional, proof of the pragmatic recognition by the Sovnarkom of the Central Rada’s declared borders of Ukraine consisting of nine gubernias, including Kharkiv, Katerynoslav, Kherson, and Tavrida (without the Crimea). The treacherous plan to “re-elect” the Central Rada in Kyiv did not work, but the Bolsheviks succeeded in reconvening the All-Ukrainian Congress of Soviets in Kharkiv, the day after they seized the city. During the congress in December 1917 the formation of a Soviet republic formally independent of Russia was proclaimed, and the state was given the same name that was adopted by the Central Rada: the Ukrainian National Republic. The Soviet government was called the National Secretariat (not Sovnarkom, like in Moscow). The resemblance to the Central Rada’s General Secretariat was also quite obvious. After setting up a Soviet center in Kharkiv, the Sovnarkom could now fight the Central Rada behind the National Secretariat’s back. Lenin said these words: “occupied regions.” He ordered the occupation of a territory that was beyond his government’s influence; in other words, to use force to attain control over it. However, on the territory under his control the leader of the Bolsheviks preferred propaganda to terror. Better results could be achieved by using deceptive propaganda and temporary concessions than the use of force. He never forgot his party’s strategic objectives and knew how to back down when he was faced with strong resistance. But in the fall of 1919, when Trotsky’s troops were liberating Ukraine from the White Guard occupiers, no one in the Kremlin was talking about the merger of both countries anymore. Thus, during that trying period most of Ukraine’s active socialist parties, among them the Ukrainian Socialist Revolutionaries and Social Democrats, adopted the communist platform. This was no coincidence. The resolution “On Soviet Power in Ukraine,” which established the political line in the republic after Denikin’s occupation, announced the restoration of national statehood and the repudiation of the transfer to Soviet state and collective farms in agriculture, as envisaged by the new program of the RCP(B). The linkage of dictatorship with democracy within the Soviet state framework created only the illusion of resolving the nationality question. However, this structure of power fostered the revival of Ukrainians’ freedom-loving aspirations that were crushed in 1920 by the million-strong army that came from Soviet Russia. All appointments at the gubernia and district levels — not to mention the Soviet Ukrainian leadership — were the prerogative of the Kremlin. However, after a lengthy period of work in Ukraine such Kremlin appointees often began to be governed by the interests of the republic. This was true of Khrystian Rakovsky, who headed the Ukrainian government since early 1919 (at the time this post was the highest rung on the Communist Party-Soviet ladder, just like in Russia). There is documented evidence that he was not very troubled whenever he was confronted by the invisible force that paralyzed his endeavors. After all, as a member of the CC RCP(B), he himself was part of this force. Unlike Rakovsky, Mykola Skrypnyk was sincerely outraged by the restrictions and directives that ran counter to the Soviet government’s declarations. He went so far as to make statements about the party’s “double-entry bookkeeping” in regard to the nationality question. In both Diaspora and post-Soviet historiography Skrypnyk is an extraordinarily positive figure. I do not want to engage in polemics about this assessment. He was a very decent individual with a tragic destiny. Nor can one overlook his Herculean efforts in derussifying the Ukrainian Soviet republic and the North Caucasus territories that were inhabited by ethnic Ukrainians. One should not underestimate his role in transforming Ukrainians from an ethnographic mass into a nation aware of its historic past. It was Skrypnyk who, together with a group of leading members of the Ukrainian Party of Socialist Revolutionaries, who initially became Borotbists and later communists, did his best to ensure that the Soviet power lost its occupational character in Ukraine. He became one of the leaders of the Bolshevik Party at an early stage and was a convinced supporter of dictatorial methods of administration. He was also one of the founders of the notorious Cheka. Communism — not in its propagandistic jacket but in its practical implementation — is always linked to dictatorship, and dictatorship — with arbitrary rule and crimes. It should be noted that the national specifics of Russian, Ukrainian, or Chinese communism never had an impact on the essence of the doctrine or on its implementation. Ukraine could be conquered by a million-strong army, but it was never fully controlled. Ukrainians had to become convinced that the Soviet government was their government. Officials, propagandists, Chekists, and teachers had to communicate in Ukrainian in official institutions, educational establishments, and the mass media. Addressing the 7th All-Ukraine Party Conference in April 1923, Trotsky noted that the estrangement of the ruling party and the Soviet apparatus from the bulk of the population was dangerous. One hundred times more dangerous, he believed, were misunderstandings with the peasantry if the latter did not belong to the nationality that was the ruling one in tsarist Russia. Hence the conclusion: they needed not only economic linkage with the peasant market (already established by the New Economic Policy); they also had to ponder the national linkage: language, school, and culture. The campaign that was launched by the 12th Party Congress became known as indigenization (korenizatsiia) whereby Soviet power took root in the national regions. In Ukraine, indigenization acquired the form of Ukrainization. Gerhard Simon, the noted German expert on the Kremlin’s nationality policy, correctly noted that indigenization was supposed to prevent the development of those national forces that had destroyed the Russian and Danubian empires in 1917-18. Concessions in terms of language, culture, and cadre policy were intended to put a halt to autonomist and separatist moods. The policy of indigenization was safe, and even useful to the Kremlin, but only to a certain extent. 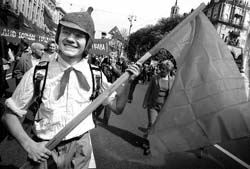 The all-Union center did not succeed in restricting itself to indigenizing Soviet power in such a nationally mighty republic as Ukraine, a nationally strong republic with great traditions of liberation struggle. Ukrainization surpassed the limits of a bureaucratic campaign and became a tool of national renascence. National communism was extremely dangerous for a party that was built on the principles of “democratic centralism.” Organizationally, it weakened the Communist Party-Soviet center, at the same time strengthening the Kharkiv subcenter, which through its scope already represented a terrible threat to the Kremlin. Sooner or later the national communists, led by Skrypnyk, who accepted the norms of the Soviet constitutions at face value, had to face the Kremlin’s preemptive repressions. They did. Soviet occupation is a term that has a right to exist. We can discuss the occupation of the territories seized by the Soviet Union under the Molotov- Ribbentrop Pact. We will not find another definition for the status of the Soviet army that entered certain European countries originally with the mission of liberation and then stayed for decades. However, applying this term to the main part of Ukraine is incorrect from the scholarly and political points of view. Scholarly incorrectness flows from everything stated above. So I will dwell on its political incorrectness. The people who had a direct part in the events launched 90 years ago by the revolution in the Russian empire are long gone. Various attitudes to these events are possible, and one can occupy the position of a certain political force or concrete political figure. All this will just be a game that will have absolutely no effect on the “dead past.” One should not use historical events to add fuel to the fire of contemporary political passions. Do we not have enough conflicts to cope with these days? However, let us return to the provocative renaming of the exposition “Not to Be Forgotten” as the “Museum of Soviet Occupation,” mentioned at the start of this article. Do most members of the Kyiv city organization of the Memorial Society share the opinion of its head, Roman Krutsyk? There is the concept of copyright. The bulk of the exposition “Not to Be Forgotten” consists of color panels prepared by Dr. Yurii Shapoval. He is adamantly opposed to the renaming and has grounds to protest this, including in the courts. Our society responded to this in a sharp and nervous manner, perhaps because Mr. Krutsyk is not a private citizen but the number-two man at the Institute of National Memory. This institute is vested with important and noble functions: to restore the historical memory of the Ukrainian people, vanquish the myths that were implanted in the minds of people in Soviet times, and to unify our society. Will this institute be able to discharge these functions with such a director? When we say “Soviet occupation,” we actually mean a completely different phrase: “Russian occupation.” When we link the hidden concept of Russian occupation to the name of the exposition “Not to Be Forgotten” — which portrays the deaths of millions of Ukrainians during the years of building Leninist-Stalinist communism — in doing so we are placing an explosive charge in Ukraine- Russia relations and activating the detonator. Mr. Krutsyk, are you doing this out of love for Ukrainians? One should not shift culpability for the political regime of one country or another to that country and the nation that inhabits it. This should not be done especially when a nation is deprived of the possibility to elect the people who represent this regime. And it is especially not worth doing this, considering that Ukrainians and Russians (along with many other nations) found themselves together under a totalitarian regime. It can be proven that Russians did more — and Ukrainians less — to foster the emergence of that totalitarian regime. There were reasons for this, partially connected with the national features of both these peoples. For example, Ukrainians fleeing from agrarian overpopulation preferred to settle in the free territories of the Asiatic part of the empire rather than work in industry in cities that were closest to their villages. As a result, workers’ soviets in Ukrainian cities became part of the Russian rather than the Ukrainian Revolution. However, the soviets destroyed Russian democracy (the Provisional Government) the same way they did the Ukrainian National Republic, whereupon they vanished from the surface of political life and dissolved into the Bolshevik Party. If we consider the national composition of this party after the implementation of the indigenization campaign, we will see that the proportion of Ukrainian members in it was approximately equal to the proportion of Ukrainians in the population of the Soviet Union. Is the multinational RCP(B)-AUCP(B)-CPSU to blame for all the tragedies? Remember what happened to this party in Ukraine. Stalin destroyed half of its 500,000 members at the same time that he inflicted the “shattering blow” (Stalin’s expression) on the Ukrainian peasantry in 1932-33. No, political regimes cannot be identified with nations. One must look closer at the reasons why those malignant processes became possible in the Leninist party, which caused such colossal losses among Ukrainians, Russians, Germans, Poles, and the representatives of all the peoples that inhabited Ukraine, Russia, and all the other republics. If we take a closer look, our analysis, built on a thorough research of Kremlin archives, will reveal the primary source of all the tragedies: the communist doctrine. Is it not paradoxical that a political force which professes the communist doctrine is part of the Ukrainian parliament and the government of Ukraine in the 16th year of independence? No, this is not a paradox; this is postgenocidal Ukraine. Stanislav Kulchytsky is a historian at the Institute of Ukrainian History, National Academy of Sciences of Ukraine.